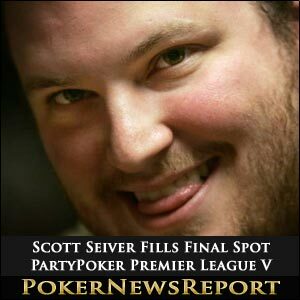 One-time World Series of Poker (WSOP) bracelet winner Scott Seiver will fill the last spot in the forthcoming star-filled PartyPoker Premier League V event in Vienna. The 26-year-old from Ohio – who pocketed $755,891 in 2008 for taking down event #21, a $5,000 buy-in No-Limit Hold’em tournament, during the 39th staging of the WSOP – will join an incredible line-up of fellow pros buying into the $125,000 event that runs from April 4 to 10 at the Austrian capital city’s Montesino Casino. While the Las Vegas-based player – who also picked up $1,618,344 for winning the World Poker Tour (WPT) $25,000 buy-in No-Limit Hold’em World Championship at The Bellagio last May – has won $4,242,645 in live tournament earnings, he is still best known as a cash-game pro. The PartyPoker Premier League V tournament – to be presented by Team Party Poker Pro Kara Scott – will feature 16 players battling it out for supremacy, the title, a huge cash prize and a $25,000 seat at the WPT World Championship at The Bellagio in mid-May. The event, which will also see two players qualify through the televised play-offs, is being staged as part of the PartyPoker.com-sponsored WPT Vienna festival that will include a €3,500 buy-in main event from April 10 to 15, as well as the Party Poker Big Game VI on April 11 for its usual 48-hour tournament. The two spots still to be filled at the Premier League V will be decided through two qualifying tournaments that start on Sunday, April 1, when 24 players – 12 of which will be invited and 12 of whom have qualified online – line up for the play-offs that will keep the internet players separate from the pros. So far, 11 pros have been invited to take part in their qualifier for one seat – and they are Bruno Fitoussi, Bartolomeu ‘Amatos’ Gomila, Erich Kollmann, Antony Lellouche, Xuan Liu, Dominik Nitschke, Steve O’Dwyer, Alexander Petersen, Giovanni Rizzo, Bodo Sbrzesny and Lock Poker Elite member Melanie Weisner. The Premier League will retain its usual format, meaning the leading three points-earners from the two eight-player groups will advance to the eight-player final table, where they will be joined by two others following the result of a series of heads-up meetings between the fourth and fifth placed players.